The last Friday of every month is teacher training and planning day in Nicaragua. The acronym is TEPCE. I forget what it stands for. Monday was my departmental Competition. Wednesday was Matagalpa’s, and Thursday was Estelí’s and Madriz’s. On Thursday, I was in Estelí helping out my friend Matt, and Thomas was in Madriz. 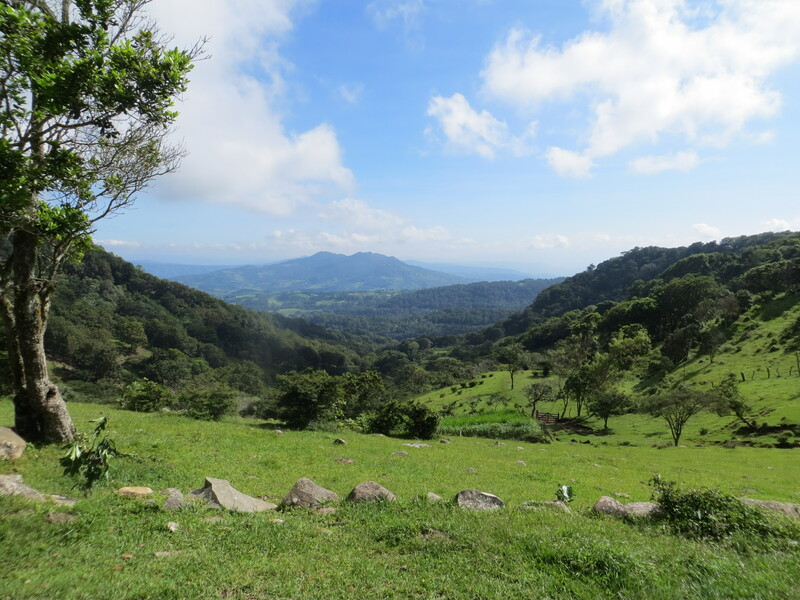 So on Friday, the three of us decided to ditch TEPCE (typically an exercise in institutional incompetence anyway) and head into the countryside in search of Don Alberto and his renowned sculpture garden outside of Estelí. I woke up feeling a little unwell. I went to the bathroom and shortly afterwards burped. The burp had a slight taste of whole wheat bread dough. For me, that’s a huge warning sign. Whole wheat dough burps only means one thing here: bacterial infections. I took an antibiotic to quell the storm churning in my intestinal tract, and headed for the bus station. Other than water, I dared not eat a breakfast. As we set out on a bus into the countryside my body started rebelling. It was saying, “Please, no hiking, no treks through the countryside today. We need AC, a bed, and a bathroom.” Maybe I should have stayed behind. But I really wanted to see the sculpture garden (it was my idea to go in the first place), and there was no turning back at this point. The bus ride was short. Maybe 40 minutes. We arrived at a small dirt road that Matt knew as the turnoff towards the direction we were headed, got off the bus, and started walking. We really didn’t know where we were headed. All the directions we had been given were very vague. But we had an idea of what we were looking for and where it was located. So we walked one kilometer down the hill and sure enough we encountered Don Alberto and his sculpture garden. Don Alberto is a chain-smoking 76 year old (his birthday just passed, in fact) and has been sculpting the rocks around his family’s farm for nearly 40 years (he told us 38 years, if I remember). He is simply a farmer who had an artistic vision from a young age. Over the last ten years he has been having more and more visitors, and he shows all of them around, free of charge. He says that he doesn’t mind walking up and down the hills with everyone – it is good for his health. Throughout our visit he interpreted his art work, recited poetry to us, and told us about all of the nationalities that have visited his sculpture garden (he thought that we were Spanish, which is a very very nice thing for a Nicaraguan to say to a Peace Corps Volunteer). The most surreal aspect of this sculpture garden is that at first glance you may think that it’s a long last pre-Colombian ceremonial site. But then you start to notice etchings that look like helicopters and the Twin Towers. Don Alberto has many inspirations for his art. He was explaining everything from Nicaraguan history, indigenous inspirations, religious pieces, current events, other countries, and wildlife. I also got the feeling that he loves his gardens and farm even more than the artwork, but I was mesmerized by all the carvings and have no knack for plant-life and forestry photography, so I have no pictures to offer of the surrounding nature other than some sweeping vistas. The most spectacular part of the sculpture garden is the wraparound cliff and lookout at the top of the property, which has been completely carved. The view was spectacular and the setting utterly unique. The sculpture garden reminded me of William Rickett’s Sanctuary in Australia, another uniquely local and wooded sculpture garden. After our visit we hiked the kilometer up from the farm and started walking again. We wanted to not only make it back to Estelí, but also to hit up the Estanzuela waterfall on our way back to the city and catch the 3:10 bus to León. We were already a bit behind schedule, and we only had our feet to rely on. There would be no buses. Only the possibility of a pickup truck to hitch a ride with. As we started walking, the sun strong and our water bottles now nearly empty, I began to feel sicker. My diarrhea stomach hurt and there was nothing I could do about it. I was slipping every few steps as we went up and down loose gravelly roads. About an hour down the road I started Billy Pilgriming and telling Matt and Thomas to leave me behind, I’d catch up. At some roadside community we did pass a small convenience store where we restocked on cold water. It was probably two hours of walking to make it to the Estanzuela trail head. Matt and Thomas went down to the cooling waters. I stayed at the top and curled up into the fetal position in the park guard’s hammock. I don’t know how long they were down there (my phone was off to save battery), but it was very rejuvenating. Unfortunately Matt and Thomas did come back from the waterfall and we had to start the march again. Throughout our entire TEPCE not a single pickup truck passed us going in the direction that we were headed. We finally reached the main road and the city at 3:14 PM – just in time to see the León bus go careening by. I was in bad shape, Thomas was sunburned, and Matt was sore and dehydrated. 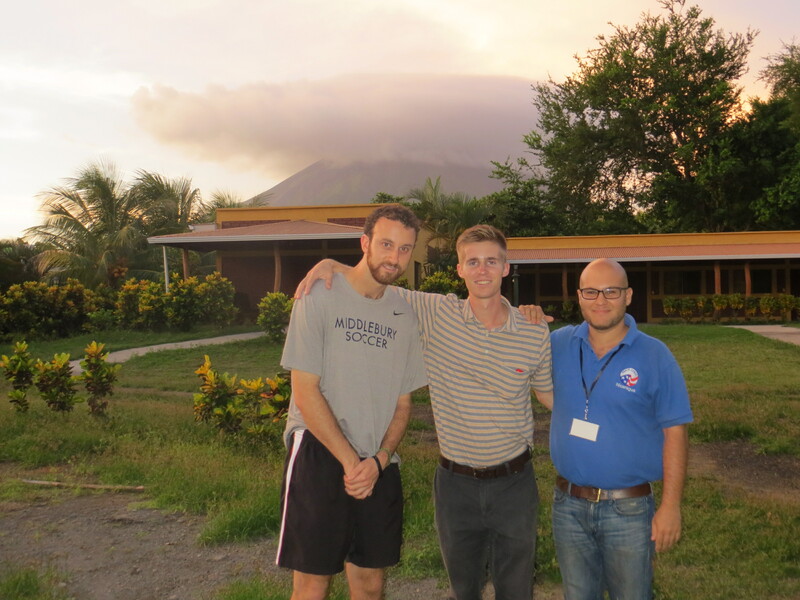 We would have to take two non-express buses to reach León, and then Matt and Thomas would have to take a third bus up to Chinandega to get to a gathering they were trying to make. Matt decided to just stay at home in Estelí. Only Thomas stuck it out. And that long trip was rough on me. I felt fevery and toxic on the buses, and we nearly missed the last bus in San Isidro, which would have left us stranded in an unfamiliar town that has no Volunteers in it. Plus, the long bus down to León decided to play an awful telenovela on full volume about Mexican drug lords. I found the story dramatically atrocious, and socially-culturally even worse. It plays on every poor race and gender stereotype in the Western Hemisphere. Truly, I detest soap operas and I can’t understand why people, especially Latinos who are often so aware of stereotypes and oppression, are drawn to them. In León Thomas did catch the last mini-van to Chinandega. It must have left at 8:45. That was the latest I had ever been in the Terminal by hours. But Thomas was happy to make the party in Chinandega, and I was thrilled to be home. Other than two bites of Thomas’ tortilla and a bite of an orange at the finca I had not eaten anything all day, but I took a chilly shower and, sparing you the details of the rest of my time in the bathroom, climbed right into bed when I got home. I was so tired I fell asleep with the door open to my bedroom. Matt and Thomas were real troopers. There were some rough times in our trek today, and they waited them out as I was doubled over in pain in the shade. I feel much better today. I just ate my first meal since Thursday dinner and it seems to be sheltering in place. There were some really rough few hours in there, but I am glad that I got to visit Don Alberto’s sculpture garden and farm. Plus, purely coincidentally, yesterday my friend Catherine posted on my Facebook a memory about our trip to William Rickett’s Sanctuary in Australia. 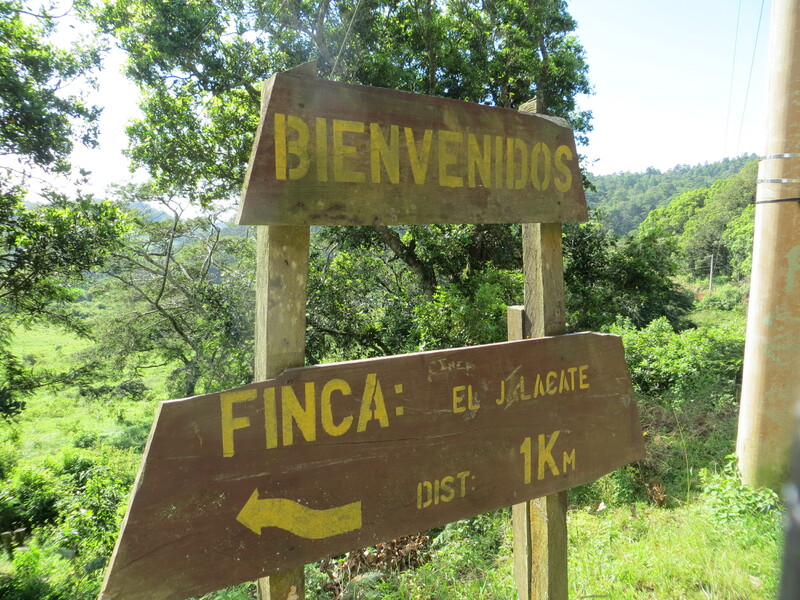 As you can tell from this post, it is not easy to get to Finca El Jalacate. My recommendation is to take the 6:30 AM bus from Estelí to Tisey-La Tejera. It leaves from the hospital in Estelí. They can drop you off right at the entrance to the farm. There is also a departure in the early afternoon at 1:30. The first return bus passes El Jalacate at around 9:30 AM. 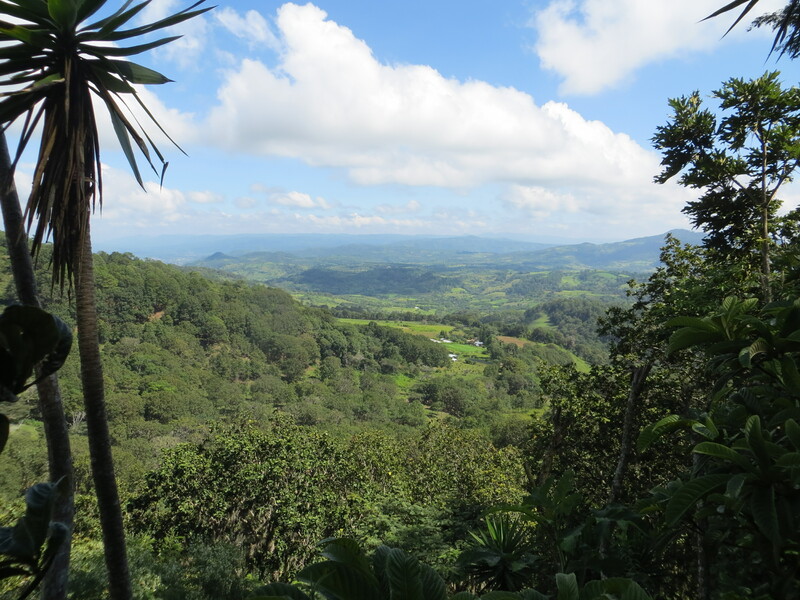 If that doesn’t give you enough time to visit the farm, then you will just have to walk back the 13+ km to Estelí. There are also buses to San Nicholas from COTRAN Sur in Estelí. We took the 7 AM. Ask to be let off at La Garnacha. This is the other end of the Estelí-Tisey-La Tejera bus. You could try to string these buses together, but I don’t know much about the San Nicholas schedule and if it takes the same return route as outbound route. For the Tisey bus, the attendant’s phone number is 5851-3794, and the driver’s number is 5777-3848. You can call either number for specifics on routes and departure times. It may be easiest to visit El Jalacate by pairing it with a stay at Eco-Posada Tisey or the La Garnacha Agro-Tourism initiative. The aforementioned buses can easily get you there. The farm is much shorter walks from these locations, and your can enjoy the offerings of Tisey and La Garnacha, the waterfall (from Tisey), and easily catch a bus a day or two later at your leisure. As a thank you, please bring Don Alberto a pack of cigarettes or a small bottle of rum. This entry was posted in Logistics, Travel and tagged 9/11, agro-tourism, agrotourism, art, Billy Pilgrim, diarreah, dirt road, farm, finca, hammock, hike, hiking, inspiration, Kurt Vonnegut, logistics, mountains, sculpture, sculpture garden, September 11, Slaughterhouse Five, stomach infection, Three Musketeers, Tisey, trek, Vonnegut, walk, walking, waterfall. Bookmark the permalink. I’m really sorry you were sick, but did any of you ever think to ask the farmer what El Jacalate means?